See two of the world's most active volcanoes, dramatic lava landscapes and get insight into the birth of the Hawaiian Islands from 70 million years of volcanic activity. The Big Island is home to numerous garden wonderlands. Hawaii Tropical Botanical Garden is rich with fertile volcanic soil and protected from trade winds. Find more than 2,000 plant species in this unique garden situated in a 40-acre valley. Nani Mau Gardens, does not disappoint with 20 acres of tropical flora as well as picturesque waterfalls and walking paths. Panaewa Rainforest Zoo & Gardens showcases animals from rainforest climates around the world in a lush garden setting. Hike a half-mile loop on the walking path through lush tropical vegetation to a scenic vista overlooking the Akaka Falls cascading 442 feet down to the gorge below. The picturesque Rainbow Falls get its name for the rainbows that appear when the 80-foot cascade hits the water below and the mist creates a prism of color in the dazzling sunlight. This lush green valley is one of the Big Island's most beautiful areas. Once a meeting place of Hawaiian kings, legend claims an otherworld gate is here and a spiritual "mana" can be felt. Its summit rises to 14,000 feet and is the only place on the Hawaiian Islands that snows in the winter. View the stars from the Onizuka Center for International Astronomy located at 9,000 feet. Located near the Hawaiian Volcano Observatory, the museum offers panoramic views of Kilauea Caldera and Halema'uma'u Crater. Exhibits explain the history and geology of Hawaii's volcanoes. Hike a nearly mile-long loop amongst a surreal landscape of lava trees, which resulted from a lava flow that left behind eerie lava molds of the tree trunks. 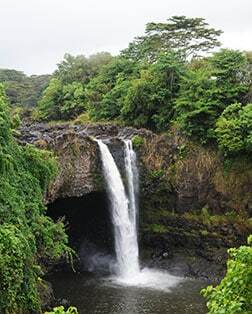 Hiking, caving, snorkeling, and kayaking amidst waterfalls are just some of the incredible outdoor activities you can participate in on Hilo.